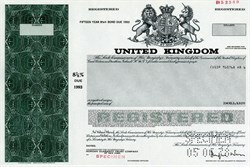 Beautifully engraved specimen certificate from the United Kingdom printed in 1978. This historic document was printed by the Security Colombian Banknote Company and has an ornate border around it with a vignette of the UK Coat of Arms, unicorn and lion flanking crown and shield on top. This item has the printed signature of the Secretary to Her Majesty's Treasury, Douglas Wass.